In addition to a range of decorative veneered and melamine products, Hanson Plywood stock a variety of edging tapes designed to complement these products. Rolls of tape are available with preglued coating to the reverse so that they can be applied immediately, or with an unglued coating that allows the user to specify the type of glue they wish to use. All tape can be trimmed down to match panel thickness. 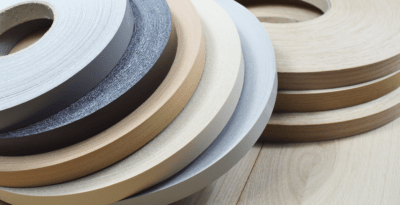 While the table below displays the edging tape we currently have in stock, we are able to source a multitude of different finishes, sizes and roll lengths from our network of specialist suppliers. If we do not have the required veneer, melamine or size in stock, please contact our sales team who will be able to source it for you.